Tracks: Violin Concerto in D major op.35a. Sonata for Violin and Piano No.2 in E minor op.36a. Frank Peter Zimmermann, born in Duisburg, Germany in 1965, is a violinist of international standard. Zimmermann performs with the major orchestras of the world, in the major venues. He started playing the violin when he was 5 years old, giving his first concert with orchestra at the age of 10. Since he finished his studies with Valery Gradov, Saschko Gawriloff, and Herman Krebbers in 1983, Frank Peter Zimmermann has been performing with all major orchestras in the world, collaborating on these occasions with the world's most renowned conductors. His engage­ments, both with orchestra and in recital, take him to all major concert venu­es and international music festivals in Europe, the United States, Japan, South America and Australia. Frank Peter Zimmermann plays a Stradivarius from 1711, which once belonged to Fritz Kreisler. After he published his musical manifesto Towards a New Aesthetic of Composition in 1908, Busoni rejected a lot of his earlier works, but the 1897 Violin Concerto and the Second Violin Sonata, composed three years later, were two pieces that he continued to value, even describing the sonata to his friends as his real Op 1. Certainly it is hard to understand why the concerto in particular has not established itself as a standard work alongside those by Mendelssohn and Bruch, which it particularly recalls in its modest proportions, transparent scoring and lack of symphonic aspirations. The sonata, on the other hand, modelled formally on Beethoven's Op 109 and including a set of variations on a Bach chorale as its finale, looks forward to the later Busoni. 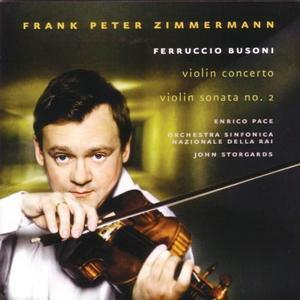 In both works, Frank Peter Zimmermann's neat, intelligent violin playing is a delight, though to my ears the intonation of the RAI orchestra wind in the concerto leaves a bit to be desired, and takes the edge off a performance that otherwise makes a convincing case for an underperformed piece.